We dry-hop this American Style India Pale Ale with seven grains and four domestic hop varieties by adding dry whole hops to the finishing tank so the beer rests "on top" of the hops for five extra days!Malty sweetness up front with big cascade and glacier hops in the finish -- a wonderfully drinkable IPA! Poured a hazy amber orange with a large fizzy mostly lasting head with fair lacing. Smelt of strong fruity apricot, pineapple and oranges, with pine and light sweet caramel and cookie malt. Taste was upfront strong bitter spruce and grapefruit rind hops and moderate sweet oranges and light caramel followed by a strong to harsh grassy bitter green hops buzz with a light honey sweetness on an average length finish. Palate was light to medium bodied, oily, fizzy, and strongly astringent. Overall, an impressive IPA that is light bodied and drinkable in the summer. Slightly on the sweet side, but it balances out the hops nicely. This is a fantastic IPA!! this brewery is only a cpule mile from my home and I was blown away by this midwest IPA. It pours with a wonderful thick head and orage/copper color. The nose is where it really impresses. An awesome pine and citrus hop cloud with underlying malt pinning. The taste was a wonderful balance of strong hops and malts. Citrus grapefruit and pine with a good malt and biscuit flavor without being sweet. The body is firm but not thick, coating the tongue and leaving flavor all the way down. This is just an amazingly drinkable beer, which has become my regular social drinking beer. As a friend said, this is the kind of beer I would brew for myself (which I am planning to do with my nest brew session). Get your hands on this beer. This was my first O'Fallon beer and I am pleased. Appearance: I poured the burnt orange-colored IPA into my Ron Jon pint glass. It verges on being too dark for an IPA, perhaps having the coloring of an amber. The head mushroomed nicely but disappeared rather quickly. Aroma: Wow. This is a hophead's dream. Very fresh hops smell strongly of citrus. After the hop A-bomb, I smell orange marmalade, Earl Grey tea, maybe some apricots, and some sweetness--that reflecting the malt in there somewhere. Taste: The bitterness covers the tongue side to side. The hops dominate, as one would expect from the aroma. There is not the balance of malt--a backbone so to speak--that so many beer advocates like with a highly hopped beer. That's ok. The flavor could use a little malt, biscuit, flavor to wipe up some of the hops, however. Mouthfeel: It's fine. Medium body. Goes down easily. 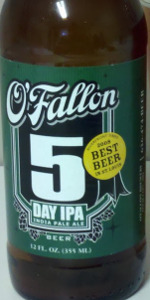 Drinability: Usually an IPA with malt backbone means that these highly-hopped IPAs run to the 7-8% ABV side of things. I prefer an IPA that one can enjoy session style. If you want to produce an Imperial IPA, then run the ABV up to 8-9%. Otherwise, keep it in the sessionable 5-6% range. I digress. Schlafly's new IPA has too much alcohol. I like this one better. I'll have another. My man BigLove added this bad boy to a trade for me. The pour yeilds a lightly ambered beer with a thin head but sturdy lacing. The smell is pine, a little lemon, fresh grass, and straw. The taste is fairly heavy in the hop department for a basic IPA. It has a soft malt tone that takes over at the finish. Not bad at all! Why O'fallon doesnt bottle this is mind boggling! poured a out of a fresh bottle into a tulip glass. color is a golden gopper-orange and a finger of off-white foam on top fades quickly and leaves little lacing. Not a lot of strong aroma, just a bit of hops, non-citrus variety. Decent bitterness on the taste side and easy drinking, but a little lighter compared to a lot of other IPA's available these days, but still tasty. 12oz bottle served in a shaker pint. Appeared to be bottle conditioned. Poured an orangish gold with a thin fine bubbled head. Nice citrus hop aroma along with some caramel, toffee malt. Definitely on the malty side of the spectrum. Medium bodied with decent amount of carbonation. Good amount of hop bitterness that really shows in the finish. The hops are fairly drying in the finish. This isn't a hop blockbuster, but very drinkable. Another example of why good, fresh, local beer rocks. Appearance: 1.5 finger off-white head, recedes quickly; brass body, unclouded, but with floaties. Not pretty, but I don’t really mind. Smell: floral and fruity hop aroma (Odd notes I’m getting: white grapes and coriander). Smells yummy. Taste: Citrusy, piney, herbal. So on, so forth. It tastes fine, but doesn’t really distinguish itself very much in any way. Thin and dry. Very disappointed with another IPA. This beer is amber, with chillhaze and floating hop particles. There is some fruitiness in the aroma. No hops. The caramel malt is overdone, making the beer sweet at the start and heavy. The taste is not bitter, but slightly sour. The bottle shows a gold medal that says best beer in St. Louis, 2008. Could the beer be from 2008? No best-by date. And I have 5 more to drink. Ugh. Reviewed from notes taken 12/26/13. I poured a thin, nearly white head over a light caramel colored body. The nose has a very nice bouquet going. Caramel starts it off. Tropical fruit follows up, including mandarin oranges, mangoes and grapefruit. A hint of pine on the back end really fills it out. Caramel and bread start up the beers taste. Mandarin orange and grapefruit move into a piney finish. The body is rather weak. The carbonation is not there, and the beer seems watery. I picked this one up in a mixed six pack on a business trip to Grand Rapids. It was one of the highlights of the six pack... Kind of lighter on taste and bitterness for most IPAs that I have tried. It's the kind if beer I would look for if I was going to have more than a couple. A-Copper with a thin white head. Nice head retention that leaves spotty lace. S-Light dry hopped aroma with a nice background of sweet caramel malt. T-Tangy, citrusy hops with the underlying smoothness of sweet caramel malts. Nothing complex or shocking just a simple, solid American IPA. M-Medium-light body with a nice sharp crispness and good, lingering bitterness. D-Decent, nothing over the top here but acceptable. I am sure this one would be better and "pop" more on tap. I would like to search this out when in MO. this beer poured a deep amber color, clear with light carbonation. A nice 1 finger, white, fluffy head slowly dissipated and laced nicely. There is quite a bit of sweet, flowery hops and malt on the nose, with just a whisp of citrus zest. This translated well to the taste. The hops were light on the tongue, yielding to medium bodied malts and grains. One intersting oberservation was the citrus and the hops seem to get larger as the tasting progressed. Mouthfeel is good, as this is a tasty yet very smooth beer. Excellent for a BBQ or a late night sipper. Poured from 12oz twist off brown bottle to pint glass. A - Huge 3 finger white head on top of a cloudy orange amber body. Good retention and lacing. S - The nose is a little subdued but has a malty sweetness, earthy hop character a bit of spice. T - Just like the nose, not overwhelming or all together that bitter. Sweet with a light fruity citrus hint. Fairly well balanced with the malty sweetness. Finishes smooth with a mild bitter sweet tongue. M - lighter end of medium, good carbonation. Note: This review was a re-post from my former account, jmkratt, which was hacked and I lost all my reviews...sorry for the redundancy. Acquired via trade from jpm30, so a big “Thank you” goes out to him. Poured from a 12oz. bottle into a US tumbler pint glass. A: The beer is a light brown color with a thin off-white head that fades slowly and leaves a thin but dense lace on the glass. S: The aroma is a nice blend of floral hops and fruity citrus sweetness, with a decent malt background, but I detected a soapy note to it that kind of threw everything off. T: The taste is a decent balance of hops bitterness and citrus sweetness. The malt character is very hearty for the style, but the dry hops bitterness eventually takes dominance in the end as it should in an IPA. The after-taste is slightly bitter. M: Crisp and smooth, medium body, medium carbonation, very dry finish. D: A little tasty, goes down ok, slightly filling, good representation of style, good kick, it's a decent beer, but it wouldn't be a beer that I would reach for when I'm in the liquor store unless my selections are very limited, since there are so many other beers in the style that I would choose above it. Pours a dark amber hue, pretty dark for an ipa, has a mild head with surprisingly there isn't a very strong scent like other ipa's, floral hops are present, but not overpowering like other ipa's. tastes vastly different than it smells, much more hoppy and has a nice maltiness to it, mouthfeel is full and rich, pretty good ipa all around.